With great enthusiasm local Labor MLA's and federal Labor representatives for Canberra assembled around 11AM on 7 July 2011 to announce that Infrastructure Australia would provide funding for the Majura Parkway. "It means this project can start in the second half of next year and can be completed on time to deal with some of the traffic demands that we've seen"
I am glad that the funding has been provided, as this is a road that desperately needs upgrading, but I'm not convinced that it needs to be upgraded to Parkway standard. Its being upgraded based on the roads significance as a freight route out of the Airport. This is why the federal government have been so keen to provide funding - by making Canberra Airport a 24 hour air-freight hub, the NSW ALP avoid a politically damaging second Sydney Airport fight. More than 40 years after the first line appeared on a map, construction of the long awaited Majura Parkway will finally start next year and be completed in 2016. Infrastructure and Transport Minister Anthony Albanese today said the project had secured the backing of the Gillard Labor Government and would receive $144 million in Federal funding, matching the ACT Government’s contribution dollar-for-dollar. “Recommended by Infrastructure Australia and set to be built with monies from our Building Australia Fund, the Majura Parkway will make it easier for Canberrans to get around their city as well as well as taking trucks off local streets,” said Mr Albanese. “Construction of this new road is an investment in Canberra’s future, with Infrastructure Australia putting its long term economic, social and environmental benefits at close to $1 billion. “Funding for the Majura Parkway builds on the record capital works program we initiated in our very first budget back in 2008. Together with the Gallagher Labor Government, we’re building the modern, well planned transport infrastructure befitting Canberra’s status as our nation’s capital. The Majura Parkway will be an 11.5 kilometre long duplicated road with seven bridges and three interchanges at the intersections with Fairbairn Avenue, Federal Highway and Monaro Highway. I'm now hopeful that the same amount of effort that has been expended on road funding will now be followed by lobbying for public transport funding. I find it amazing that Senator Lundy can claim that there has been a 'persistent and passionate community campaign' for this road funding. I've been involved with community issues for many years, not just as Chair of ACT Light Rail, but also as a member of the Belconnen Community Council, and I've not come across this pro-road grass roots movement before. The ABC also carried news of the announcement (Federal funding for Majura Parkway) and asked other local political parties on their views towards the requirement for another road, and its priority in comparison to other transport requirements. ACT Opposition Leader Zed Seselja has also welcomed the news. "We're certainly pleased there is some contribution by the Commonwealth," he said. "I think what's really important now is that the ACT Government demonstrate that they actually can deliver it in a reasonable time frame on budget." But the ACT Greens say the project should not go ahead. Greens MLA Amanda Bresnan says there are better transport options. "The Greens obviously are always happy when we get federal funding. It's just that we would have actually liked to have seen this go to something different, that is to public transport," she said. "It's a shame that the ACT Government didn't put the same lobbying effort that they put into Majura Parkway, that they put into their bid to Infrastructure Australia, for light rail." These two views clearly show the reality as opposed to the spin of the announcement. The ACT Government have a demonstrated inabilty to fund, build and complete major public works on time and within budget. Amanda Bresnan is also correct. Despite the Light Rail bid being the ACT Governments Primary bid for IA funding in 2009, the latest IA report to COAG contains no mention of that bid at all. It has simply been forgotten. One has to ask the ACT Government this question - are you serious about building light rail or simply announcing the possibility of light rail as a media spinning political tool to appear as if you are serious about improving public transport in the ACT ? One way the ACT Government can demonstrate their commitment to public transport is by funding a engineering study for an initial light rail route, and include that study as part of a revised bid to IA for funding. They could also demonstrate real leadership and find the funding to build an initial light rail line. One positive out of the latest ACT Budget is that they have reversed a long standing ACT Government stance on not borrowing money to build infrastructure. That this money will be used on a road is not my preference, but now that the willingness to 'borrow to build' has been shown it should be capitalised on. The $280 million that is estimated as the cost of the Majura Parkway is an amount that could easily fund a light rail route between Gungahlin and Civic. What would provide a better return to the people of Canberra ? ACT Light Rail will continue to lobby for the bid to be revisited. 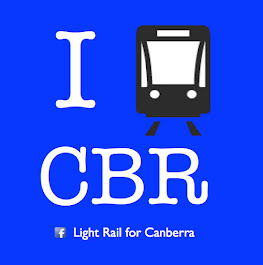 Contact your local MLA's and Federal representatives and tell them that you would like to see light rail in the ACT. Encourage them to apply the same effort to public transport funding that they have for road funding. Whilst I agree that light rail is something which would be fantastic to have in Canberra, and would undoubtedly lift participation rates in public transport usage, I also support funding for the Majura Parkway. Whilst I am not a resident of Gungahlin, I have seen several times the amount of traffic that gets caught in the bottlenecks at either end, and along the current Majura Rd. Additionally, that transport corridor is not highly suitable for public transport and probably won't be for quite a number of years. A final note on Light Rail bid to infrastructure Australia.... I have heard Michael Deegan from IA speak a couple of times and it is clear from what he says that the infrastructure that will be supported under that program must add value to the national economic and productivity effort. It generally won't fund public transport projects, but will go towards projects such as Ports and freight access roads to ports (and airports). Its all about relieving economic bottlenecks. Whilst Light Rail for Canberra would certainly need Commonwealth funding contribution, it would need to be from a different 'bucket of money' not from Infrastructure Australia. ACT Light Rail also support the funding for Majura rd. We are not anti-road. We would like to see the same effort put into public transport funding as there has been to funding a freight route. I agree that there are bottlenecks on that road, this is due to poor road engineering - two roundabouts and misalignment between the Monaro and Majura Rd causing a dogleg and multiple sets of traffic lights. What you have heard from Michael Deegan is different from what we have been told - the ALP have specifically stated that they want to fund public transport using IA. The fact that the ACT has dropped the ball on its light rail bid is a tragedy. I would point you to the ACT Governments IA bid for Light Rail to find the figures you seek on improved productivity and economic benefit. They are compelling. Finally to address funding - I agree that IA is no the sole source of funding. The ACT Government can show real leadership and find funding from multiple sources including borrowing for infrastructure, bonds, entering into a PPP or any of a range of other methods.